17th-18th centuries - British plunder and extend their influence over the inhabitants of Nicaragua's Caribbean coast. 1821 - Nicaragua becomes independent, but is incorporated into the Mexican empire. 1823 - Nicaragua becomes part of the United Provinces of Central America, which also comprises Costa Rica, El Salvador, Guatemala and Honduras. 1860 - British cede control over the country's Caribbean coast to Nicaragua. 1937 - General Somoza elected president, heralding the start of a 44-year-long dictatorship by his family. 1956 - General Somoza assassinated, but is succeeded as president by his son, Luis Somoza Debayle. 1972 - Managua is devastated by an earthquake that kills between 5,000 and 10,000 people. 1979 - FSLN military offensive ends with the ouster of Somoza. 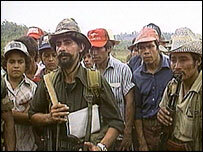 1982 - US-sponsored attacks by Contra rebels based in Honduras begin; state of emergency declared. 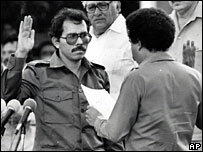 1984 - Daniel Ortega elected president; US mines Nicaraguan harbours and is condemned by the World Court for doing so. 1987-88 - Nicaraguan leadership signs peace agreement and subsequently holds talks with Contra; hurricane leaves 180,000 people homeless. 1990 - US-backed centre-right National Opposition Union defeats FSLN in elections; Violeta Chamorro becomes president. 1992 - Earthquake renders 16,000 people homeless. 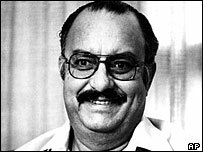 1996 - Arnoldo Aleman elected president. 1998 - Hurricane Mitch causes massive devastation. Some 3,000 people are killed and hundreds of thousands are left homeless. 2001 November - Liberal party candidate Enrique Bolaños beats his Sandinista party counterpart, former president Daniel Ortega, in presidential election. 2002 March - Opposition Sandinista party re-elects Daniel Ortega as its leader despite his three consecutive defeats since 1990. 2002 August - Former president Arnoldo Aleman charged with money laundering, embezzlement during his term in office. 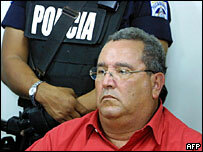 2003 December - Arnoldo Aleman jailed for 20 years for corruption. A year later he is transferred to house arrest. 2004 January - World Bank wipes 80% of Nicaragua's debt to the institution. President Bolaños says it is the best news for the country in 25 years. 2004 July - Agreement with Russia to write-off Nicaragua's multi-billion-dollar Soviet-era debt. 2005 April - Rises in fuel prices and the cost of living trigger weeks of sometimes-violent street protests. 2005 June - The government and an opposition alliance, which controls Congress, become embroiled in a power struggle. OAS head Jose Miguel Insulza tries to mediate, without success. 2005 October - Political crisis eases as Congress agrees to delay constitutional reforms, which will weaken the powers of the president, until President Bolaños leaves office in 2007. 2006 April - Free trade deal with the US comes into effect. Nicaragua's Congress approved the Central American Free Trade Agreement (Cafta) in October 2005. 2006 October - President Bolaños unveils plans to build a new ship canal linking the Atlantic and Pacific Oceans. MPs approve a tough new bill that bans abortions, including in cases where the mother's life is at risk. 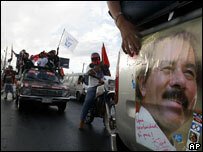 2006 November - Ex-president Daniel Ortega is returned to power in elections. 2009 July - President Ortega announces plans to change the constitution to allow him to stand for another term in office. 2009 October - Constitutional Court lifts ban on president seeking re-election. 2010 November - Tension with Costa Rica over their disputed river border. 2010 December - President Ortega's government was financed by proceeds of the drugs trade, according to Wikileaks' US diplomatic cables. 2011 November - President Ortega is re-elected for another five-year term with a landslide victory in presidential elections. 2012 September - The San Cristobal volcano erupts, prompting the government to order the evacuation of thousands of people northwest of Managua. A powerful earthquake strikes neighbouring Costa Rica at the same time.